Negaraku, Malaysian National Anthem, plays for Jazeman – he wins in Pau! 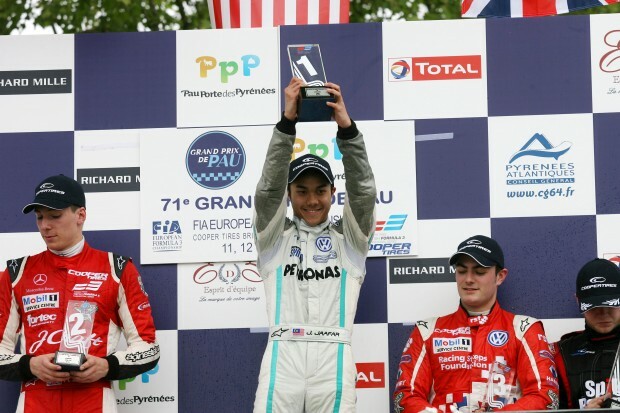 Young Malaysian driver, Jazeman Jaafar, was on the top step of the podium on Saturday in Pau, France, celebrating his first win in the British F3 International Series. A second place finish on Sunday backed up his brilliant victory and with these strong results he now lies second in the overall British F3 Drivers’ Championship. PETRONAS-supported Jaafar, competing in the third round of British F3 at the weekend, showed his ever-improving driving skills at one of the most challenging tracks on the F3 calendar, the temporary circuit on the streets of Pau, France, built for the annual Grand Prix de Pau weekend, an historical event in the motorsport calendar. Joining with the European F3 Championship for the two races, Jaafar was on top form right from the start. In the opening practice session Jaafar set the pace in the early stages of the session, finishing second quickest of the British F3 drivers and third overall. In scorching temperatures Jaafar hit top gear in the afternoon practice session, posting the quickest lap time of the session overall, over a tenth of a second clear of his nearest rival. Saturday morning qualifying produced the anticipated frantic fight for clear track to secure the best starting position and Jaafar was always one of the front men in the session. An F3 Euroseries driver, Ferrari F1 protégé, Raffaele Marciello, took pole position for both of the races with the two quickest laps of the session. Jaafar set the best lap time of the British F3 runners to take third on the grid for the first race behind two Euro F3 drivers, and also lined up third for the second race, having posted second quickest lap time of the British F3 drivers for this grid. The first of the two races, held in hot, dry conditions on Saturday afternoon, was won by F3 Euro Series driver Marciello, but it was Jaafar who starred in the British F3 fight for honours. The 19-year-old driver didn’t have the best of starts off the line, but he soon put this behind him and chased after the cars ahead. When second and third placed drivers, Daniel Juncadella and Pascal Wehrlein collided at a hairpin, Jaafar slid through into second place. A safety car period to recover the stricken cars bunched up the field and Jaafar was keen to use the opportunity to challenge for the lead. Jaafar made a bold, spirited attempt on Marciello at the restart and his Italian rival had to defend hard to stay ahead, but he was able to pull away from Jaafar and retain the lead until the chequered flag. Jaafar’s outstanding drive was rewarded with the Carlin driver’s first British F3 victory and second place overall in the race. The main Grand Prix de Pau feature race was held yesterday and Jaafar, lining up in third place, once again showed his gritty driving and front-running pace. Pole-sitter Marciello was off the line first, with Jaafar’s team mate Carlos Sainz close behind in second. Marciello had the speed to keep a distance from the Carlin men and it was Jaafar who was attacking Sainz hard from the start, while also having to defend from Juncadella behind him. The Malaysian youngster kept his cool, pressurizing Sainz while staying clear of Juncadella throughout the race, to finish third on the road and second in British F3. The fourth round of the British F3 International Series takes place at Rockingham Speedway, Corby, England from 9-10 June.